MS | MS is all about being MegaSpecial! It had been arranged with work colleagues from different branches, unfortunately a number of those that had signed up to do it dropped out for one reason or another, we didn’t! I had signed myself & my partner up for it months before and we weren’t going to let what had happened recently stop us! I was determined! We both were! We had said from the start that we wouldn’t be running it, instead we were going to walk the 5k.Whilst we were away in Somerset we did literally walk for miles so the distance didn’t seem much of a challenge even though I was a lot slower than I used to be, my pace now suited my partner! Making sure we had comfy clothes on and even more importantly the correct footwear, we made our way to the race! We had agreed to meet the other ladies there and hoped we would find them in the crowd! I hadn’t anticipated the amount of people who would be there and I found it quite daunting to be honest. Heart pounding we started to scout the field for my work colleagues. In luck we found everyone and gathered in the correct areas for those walking, jogging and running!The starting pistols were fired marking the start for all the runners, two of my colleagues were running so they went before us. The next pistol was fired again for those that were jogging to start. Finally the last pistol was fired and all the walkers made their way around the 5k course which is just over 3 miles. Nothing compared to the walks in Somerset! That’s what I kept telling myself anyway! It would be a breeze, just a casual walk in the park! It turned out to be one of the hottest days of the year! We weren’t expecting it! It’s a good job I had taken the suntan lotion, our hats and plenty of water (That’ll make my Mum happy to know) but that didn’t help with the heat! At one point I remember pouring water over our heads to cool us down! It was great to see helpers at different points of the race handing out drinks which was a welcomed sight as we were out of water! We ploughed on through, passed all the checkpoints and eventually reached the end, tired and hot! We did it! I felt so proud of us both! Unfortunately I can’t remember what time we did the race in but it was impressive! We do have certificates though and they are safely packed in a box along with our medals! Because it was so hot, we didn’t do much talking so there was plenty of time for thinking but I didn’t once get down about would could be because, like I said before, I didn’t know enough about it! 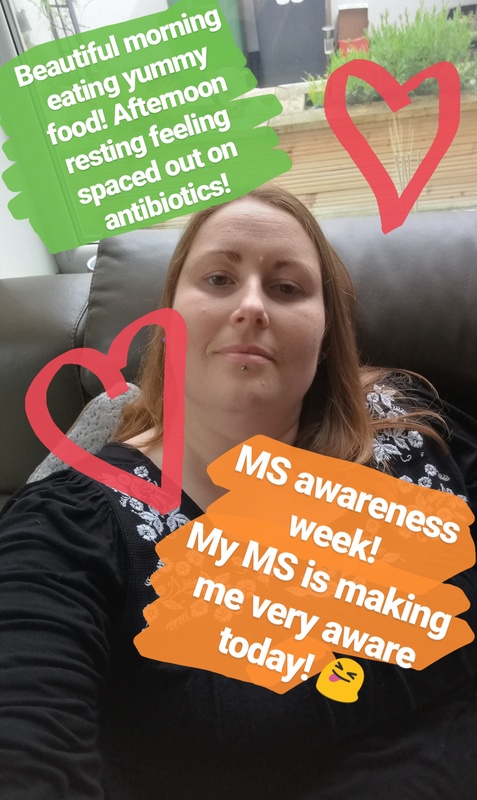 I couldn’t help but think, how can I possibly have MS! I just walked 3k!